Kick start your morning with a smoothie blended with zesty ginger, parsley, and lemon – a delicious cancer-fighting formula that’s also great as a pick me up mid-day snack! 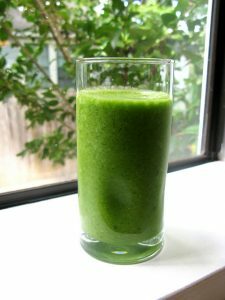 Most of us don’t consume enough greens, and this smoothie is an easy way to start the day off right. Spinach is a staple superfood that has been shown to improve blood glucose control, lower the risk of cancer, and improve bone health, as well as dozens of other known health benefits! Parsley is so much than a garnish! This common herb has powerful nutraceutical properties that help decrease our risk of numerous diseases − including cancer. And the health benefits of ginger can’t be overstated. Ginger can help put out the fire of inflammation with a high level of antioxidants, as well as numerous benefits from therapeutic compounds like gingerol, shogaol, paradol, and zingerone. One of the most impressive benefits of ginger is its anti-cancer properties, thanks to the presence of a powerful compound called 6-gingerol. Drink up and fight cancer, cup by cup. 1. Place all ingredients into a high powered blender and blend until smooth to enjoy.